Does anyone know of any horses with these prefixes or suffixes or even actually one? Bumping up in case new members know anything. Hi,On a wet afternoon I came across this forum and found an old post asking about the whereabouts of Shamnar Beau, bred by S.Lea from Surrey. I have owned him(aka Harim) since 1995. He is now a very sprightly 24 year old who is the love of my life!He has had fun over the past years competing in local riding club competitions, jumping was his and still is his passion although we are now without transport and so outings are not so frequent. This year he won his first in hand veteran class at a local show and hopefully will carry on to do many more! Would love to hear about any of his siblings! Sorry to ask again, Pop but what is her name? What is the name because I would imagine the pony was bred by Sue Lea. In fact, would have to be to have the prefix. I don't have many good ones of her, she is very polite, and a little shy. 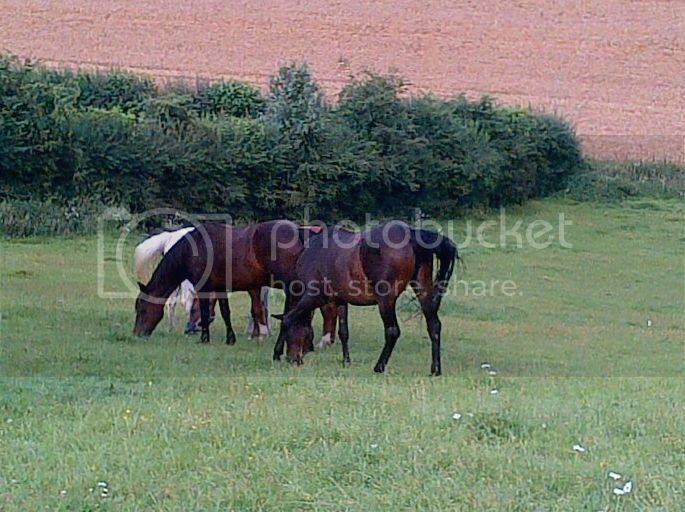 First picture is 'them' playing hide the chestnut. I panicked, couldn't see her anywhere; and then I realised their little game. Not a good photo, she is really very pretty indeed. When she moves, she is jaw dropping. POP...you should know better.... we need pics!!!!!!!!!!!!! I have a Shamnar prefix pony; she is loaned to me, from a really nice lady. She won't sell her, which I understand; but I think/hope she will stay with me forever, its certainly looking that way. She is an absolutely brilliant pony, in all ways. I could not wish for a better friend. ETA: Bit of an old thread thou. 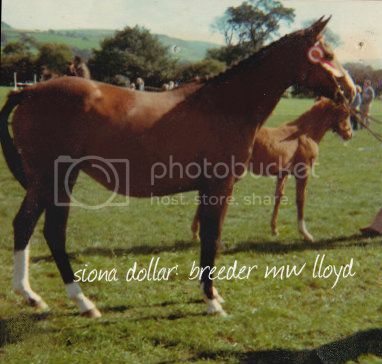 This is a photo of Margaret Lloyd's home-bred foundation Anglo Arab mare 'Siona Dollar' (b. 1974) who was by Sidi Bou Sbeyel out of her retired racehorse TB mare Ona Dollar. The foal in this photo is Upton Dollar Hills who went on to become Grade 1 anglo racehorse in 1980s. 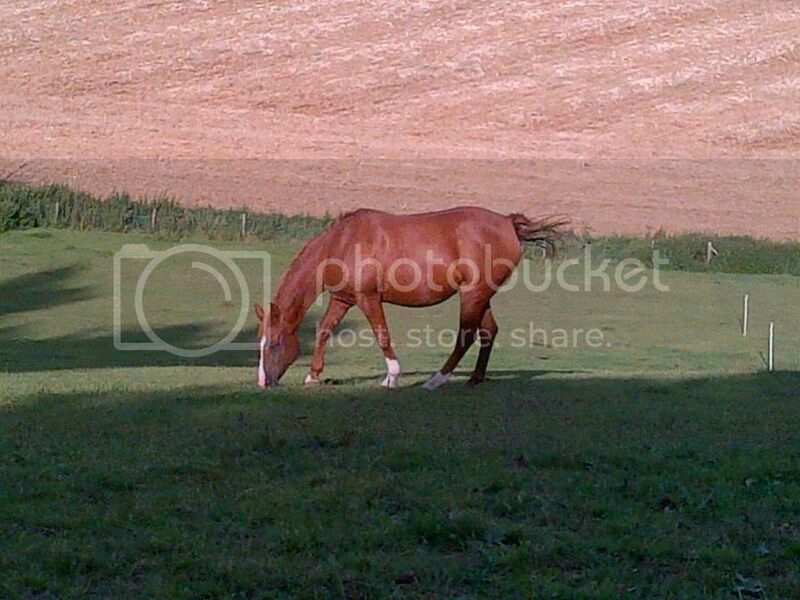 We had a super little chestnut mare Garalee by Sidi Bou Sbeyel. I understand he raced sucessfully. A liner Evie's Tara (Vlacq Itarille)is out of her. I remember Jazmir and , of course, his mother Jazirah Sbeyel. A very good friend of mine, Sue Lea, had The Lady Katerine who was by Mikeno and out of The Lady Idar. I have some descendents of Katie. Her daughter is the spitting image of her and the Lady Honorine. Sue Lea also owned Jaala Sbeyel, who was by Darjeel out of Jamila Sbeyel. I think she was the full sister of Jazirah. Sue also has Jacinda Sbeyel for some time before Keith Bernard bought her. All these ladies were bred by Godfrey Giles. I have always regretted not being able to breed more from Tamila as they make wonderful riding horses and have suberb temperaments. Sorry to go on so but I just adore these bloodlines. If you check the pedigree of Jazmir 'all breed is good for this' you will find that his dam was a Sbeyal mare. They came from The Lady Idar who had several offspring with Sbeyal in their name. Mrs Jean Downs bred Jazmir who was by her Greatheart Stallion Marania Gold. Jazmir has at least two sons still with us. One is Silver Sandpiper and the other is Sundance. These two are both GSB stallions. Not sure what else is left from these lines but they they produced very good riding horses. If I remember correctly The Lady Idar and all the other 'Lady's were of the Managieh strain.